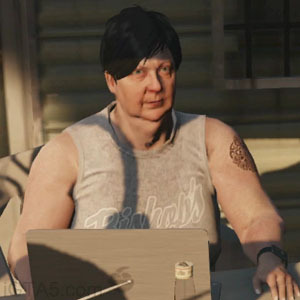 Maude Eccles is a character in the HD Universe who appears as a minor character in Grand Theft Auto V. She runs a bounty hunting business in Blaine County. She is voiced by Jodie Lynne McClintock. Maude Eccles is, by 2013, living in a trailer in Grapeseed and owns of a bounty hunting business with a number of outstanding bounties. She hires Trevor Philips, an old acquaintance, to capture Ralph Ostrowski, Larry Tupper, Curtis Weaver and Glenn Scoville. She also had outstanding bounties on a number of the O'Neil Brothers until a number were killed at their farm/methamphetamine factory and were hunted by Trevor, Michael De Santa, Franklin Clinton and Chop. After Trevor deals with Weaver, Maude tells him of her retirement plans of having a garden with a white picket fence, a husband, and a dog named Skip, adding that she is retiring. She has no further role in the storyline afterwards. @MaudeEccles: Anybody know which of the O'Neil's got killed this time? Was it Elwood? Or Doyle? Or did Doyle get killed at the farm? Got outstanding bonds on half them brothers but can't tell 'em apart for the life of me! This is Maude of Grapeseed. Please leave a message if you have any information relating to the whereabouts of unaccounted for delinquents. Maude takes medication containing testosterone, although the reason for needing the medication is unknown. Her business is listed on Trevor's bank statements as Canine Renditions, a probable reference to the TV show Dog the Bounty Hunter. She has the same calculator watch as Trevor, and an iFruit laptop identical to Franklin's. Her phone number is 328-555-0185. Melvin mentions that he was rejected when he attempted to ask her out. The exterior of her trailer. This page was last modified on 28 September 2014, at 17:42.